Charlie Powers' playing has been described by The Washington Post as "poised, elegant, supple of phrasing and mellow of tone." 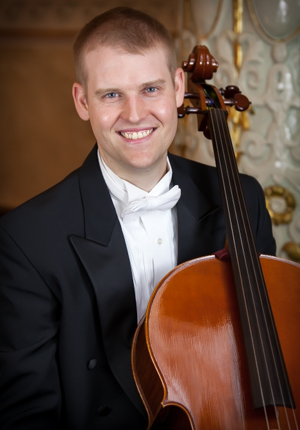 He joined the Pittsburgh Symphony Orchestra's cello section during the 2013-2014 season. He previously served as Assistant Principal of "The President's Own" U.S. Marine Chamber Orchestra in Washington, D.C., and performed regularly at the White House, the State Department, the Library of Congress, the Kennedy Center for the Performing Arts, and the Vice President's residence. Since making his solo debut at age 17, Powers has appeared with orchestras throughout the United States and abroad. Notable performances include Samuel Barber's Cello Concerto with the U.S. Marine Chamber Orchestra and Brahms' Double Concerto with the Kaohsiung City Symphony Orchestra in Taiwan. A proponent of new music, Powers has recently performed works for cello and orchestra by Aulis Sallinen and Jennifer Higdon. Powers is a founding member of two critically acclaimed chamber ensembles, the Teiber String Trio and The Phillips Camerata, as well as the recently formed Pittsburgh Cello Quartet. He has collaborated with such renowned artists as Yo-Yo Ma, Ricardo Morales and Peter Wiley. He received the Karl Zeise Memorial Cello Award at Tanglewood, where he served as principal cellist of the Tanglewood Music Center orchestra under James Levine. Other festival appearances include Banff, Heifetz, Aria, Icicle Creek and the 2000 World Cello Congress. A native of Tacoma, Washington, Powers began his cello studies at age three with Jeannette Chapman. He graduated with honors from the New England Conservatory of Music, where he was a Piatigorsky Scholarship recipient and studied with Colin Carr. Other influential teachers include John Michel, Richard Aaron, David Wells and Michael Mermagen.